WASHINGTON (AP) — President Donald Trump’s supporters on Friday cast his decision to abandon the world’s climate change pact as a “refreshing” stance for the U.S. that would save jobs and unburden industry. In a fierce rejoinder from across the globe, leaders of other nations and scientists pointed to jobs that could be created in green technology and the edge China could be given as a result. China has overtaken the U.S. in transitioning to renewable energy, generating a fifth of its electricity from renewable sources. The U.S. only sources about 13 percent of its electricity from renewable energy. Pence called Trump’s decision “refreshing.” The Paris deal “really put an extraordinary burden on the American economy while allowing some countries around the world like China and India to literally go a decade or more without any accountability for reducing C02 emissions,” Pence said. He said the deal would have cost taxpayers billions of dollars. “In a very real sense, it was a transfer of wealth from the most powerful economy in the world to other countries around the planet,” Pence said. Conway made similar remarks in an interview on Fox News, citing “fairness” to American workers and businesses. White House talking points on the decision sent to Republican lawmakers Thursday and obtained by The Associated Press made similar arguments. Scientists say Earth is likely to reach more dangerous levels of warming sooner as a result of the president’s decision because America’s pollution contributes so much to rising temperatures. Calculations suggest withdrawal from the Paris accord could result in emissions of up to 3 billion tons of additional carbon dioxide a year — enough to melt ice sheets faster, raise seas higher and trigger more extreme weather. While Trump and Pence have suggested the possibility of renegotiating the agreement, the leaders of Italy, Germany and France have said that won’t happen. Germany’s environment minister told reporters Friday “there will be no new deal with the United States” on climate change and predicted global climate will “survive” Trump’s maximum presidential term of eight years. Barbara Hendricks said other countries will fill the leadership void left by the United States but none will be expected to make up the shortfall in emissions reductions caused by Washington’s exit. 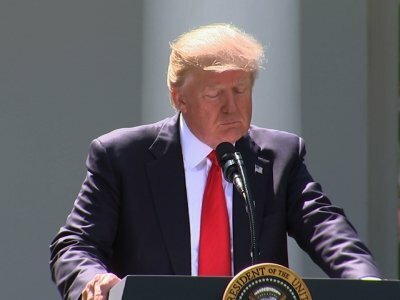 In announcing his decision, Trump said he was “elected to represent the citizens of Pittsburgh, not Paris.” By abandoning the world’s chief effort to slow the tide of planetary warming, Trump was fulfilling a top campaign pledge after weeks of building up suspense over his decision. He is breaking from many of America’s staunchest allies, who have expressed alarm about the decision. Several of his top aides also opposed the action, including his daughter, Ivanka Trump. Under former President Barack Obama, the U.S. had agreed under the accord to reduce polluting emissions by more than a quarter below 2005 levels by 2025. But the national targets are voluntary, leaving room for the U.S. and the nearly 200 other countries in the agreement to alter their commitments. But the national targets are voluntary, leaving room for the U.S. and the nearly 200 other countries in the agreement to alter their commitments. Secretary of State Rex Tillerson, who had urged Trump to stay in the Paris deal, did not attend the ceremony, nor did Trump’s son-in-law Jared Kushner and his wife, Ivanka, both close advisers to the president who supported staying in the agreement. A White House official said the couple instead attended service at synagogue for the Jewish holiday of Shavuot.